(Columbine, Shortspur (Aquilegia brevistyla) - 01) A patch of shortspur columbine highlights the edge of the road in late spring. 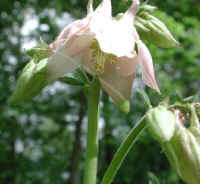 There are about 25 species of columbine in the United States. Most are in the mountain states. In the eastern United States there are only 2 species, both of which are in this series of the Wild Flowers of Sleepy Hollow Lake. 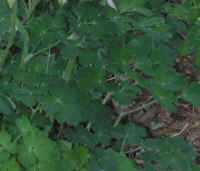 (Columbine, Shortspur (Aquilegia brevistyla) - 01a) Even when they are not blooming, the distinctively scalloped shaped, three leaflet, palmate structure of the leaves of the columbine identify this wildflower. 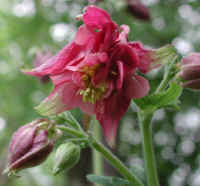 The leaflets of the shortspur columbine appear to be fuller and touch one another, though we could not find such a distinction in the literature. 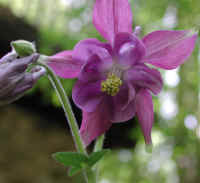 (Columbine, Shortspur (Aquilegia brevistyla) - 02) The shortspur columbine comes in a variety of colors from a light pink (foreground) to a maroon or purple (background). (Columbine, Shortspur (Aquilegia brevistyla) - 03) This is a patch of shortspur columbine that is growing in our yard with some vinca that escaped from a planter barrel. 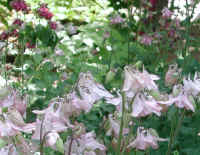 (Columbine, Shortspur (Aquilegia brevistyla) - 04) This is another patch of shortspur columbine that is growing in our yard. Just scatter the seeds and you get a new patch! 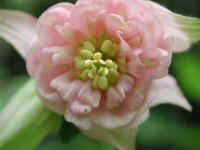 (Columbine, Shortspur (Aquilegia brevistyla) - 05) This is a close up view of one of the shortspur columbine flowers. 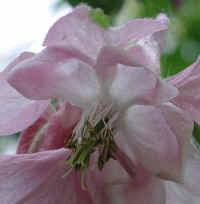 In this photo, we are looking upward into the down-hanging flower. Each of these wild flowers have five petals that form tubes in the interior. 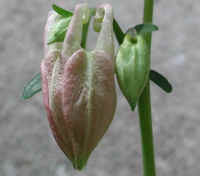 The broader petal-shaped structures are the sepals. (Columbine, Shortspur (Aquilegia brevistyla) - 05a) This bee's eye view of the shortspur columbine provides a better look at the "petal tubes" and the stamens and pistils. 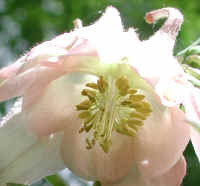 Note that one pistil and several stamens emanate in clusters from the center of the flower at the edge of each tube. 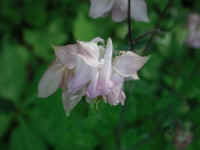 (Columbine, Shortspur (Aquilegia brevistyla) - 06) This shortspur columbine is nearly white. 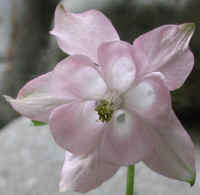 Another characteristic of the shortspur columbine is the hairiness of the stem. (Columbine, Shortspur (Aquilegia brevistyla) - 07) In this bee's eye view of the shortspur columbine, we get a closer look at the flower interior and one of the spurs at the top of the flower. To put the size of this photo in proper perspective, the actual length of the spur is about 1/4 inch. (Columbine, Shortspur (Aquilegia brevistyla) - 08) In this photo of the shortspur columbine, we have captured a tiny bit of the splendor of God's creation in the beauty of the flower and the dots of refracted light in the background. We're not sure what caused this light effect, but since we were aiming the camera upward, it may have been caused by pin-points of light shining through the leaves of the trees. 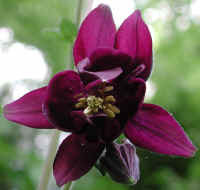 (Columbine, Shortspur (Aquilegia brevistyla) - 09) There is something really dramatic about this photo of the shortspur columbine, for it captures the color and intricate detail much larger than its actual size and displays it before our eyes. 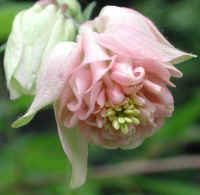 The greenish tips differentiate the sepals from the petals. (Columbine, Shortspur (Aquilegia brevistyla) - 10) This close up side view of the shortspur columbine gives us a good look at all five spurs. Each spur, including the curved portion, is only about 1/4 inch in length. (Columbine, Shortspur (Aquilegia brevistyla) - 10a) This is a view of the buds of the shortspur columbine in various stages of development. 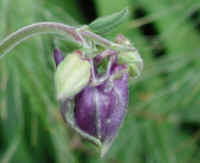 (Columbine, Shortspur (Aquilegia brevistyla) - 11) This shortspur columbine has just opened, and a bud is getting ready to open. 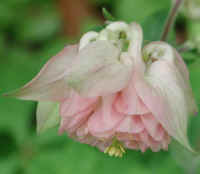 (Columbine, Shortspur (Aquilegia brevistyla) - 12) Every spring we await the appearance of these elaborately beautiful shortspur columbine flowers which come forth in their various colors. 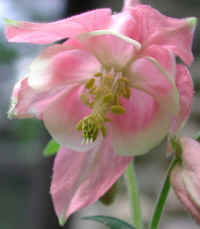 (Columbine, Shortspur (Aquilegia brevistyla) - 13) In this photo of a delicate pink shortspur columbine we are able to see up into three of the petal tubes to the beginning of the spurs. (Columbine, Shortspur (Aquilegia brevistyla) - 13a) We found it interesting that the 1/4 inch long spurs of shortspur columbine develop their full size even before the bud opens. 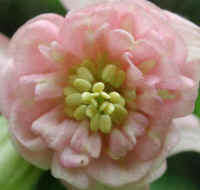 Note the way the part of each petal that forms the spur pushes up between the sepals. 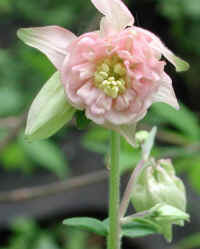 (Columbine, Shortspur (Aquilegia brevistyla) - 14) Another shortspur columbine displays her beauty for us to enjoy. (Columbine, Shortspur (Aquilegia brevistyla) - 15) Some of the shortspur columbine's petals are multicolored. 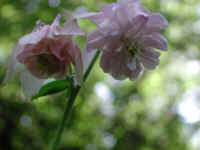 At the open end of the "tube" the petals of this wild flower change from pink to nearly white. (Columbine, Shortspur (Aquilegia brevistyla) - 16) In nature, there is such a variety of colors, textures, smells and sounds that there is always something to enjoy, if we allow ourselves to do so. 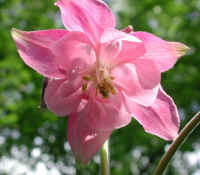 This shortspur columbine is just one small "note" in God's "symphonic" creation. Let us work together to preserve it! (Columbine, Shortspur (Aquilegia brevistyla) - 17) After several years of observing these shortspur columbine, we spotted this one that has double the number of petals. 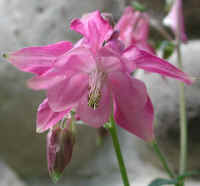 (Columbine, Shortspur (Aquilegia brevistyla) - 18) This is another look at the shortspur columbine double flower. 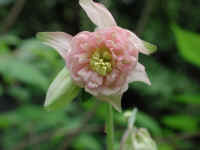 (Columbine, Shortspur (Aquilegia brevistyla) - 19) This is a closer look at the shortspur columbine's double flower. (Columbine, Shortspur (Aquilegia brevistyla) - 20) This is a bee's eye view of the inside of the double shortspur columbine flower. 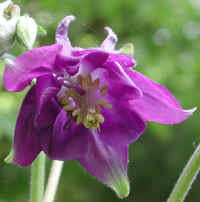 (Columbine, Shortspur (Aquilegia brevistyla) - 21) This is a side view of the double flower of the shortspur columbine. (Columbine, Shortspur (Aquilegia brevistyla) - 22) This is another close up look at the double flowered shortspur columbine. 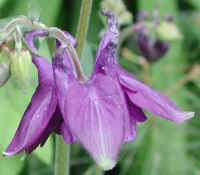 (Columbine, Shortspur (Aquilegia brevistyla) - 23) This is another view of the double flowered shortspur columbine. 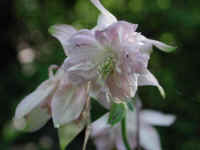 (Columbine, Shortspur (Aquilegia brevistyla) - 24) This is another photo of the double flowered shortspur columbine. 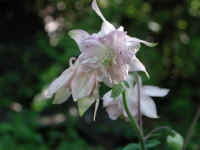 (Columbine, Shortspur (Aquilegia brevistyla) - 25) Note the difference between the petals of the right double flower and the petals of the flower on the left, even though they are both on the same plant. 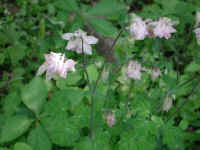 (Columbine, Shortspur (Aquilegia brevistyla) - 26) This is another look at a double flowered shortspur columbine. (Columbine, Shortspur (Aquilegia brevistyla) - 27) This is a look at the small patch of shortspur columbine in which we observed the double flower.